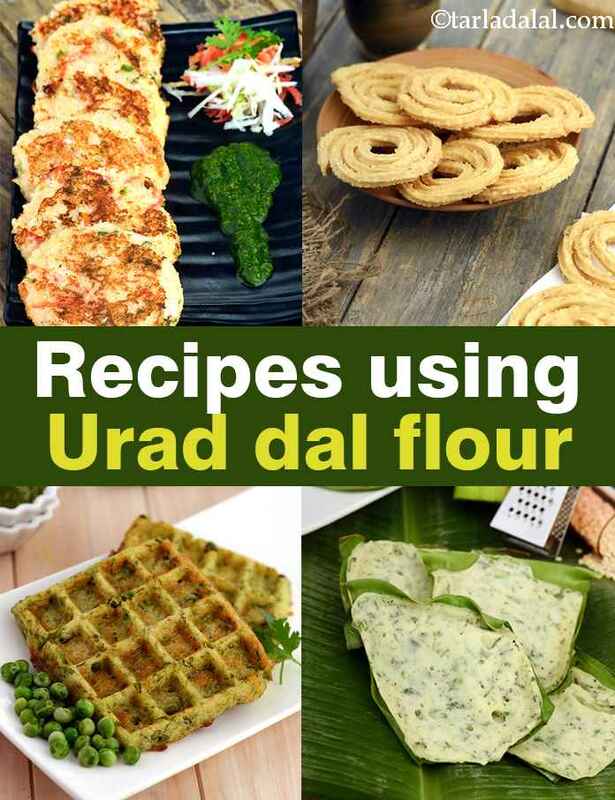 Urad dal flour recipes |26 urad dal flour recipes. Whole urad is cleaned, roasted and then ground into urad dal flour. It is readily available in THE market or you can even prepare it at home. Urad dal flour is used to make deep-fried jar snacks like Butter Murruku, Thattai. They can be made in large batches and stored in air-tight containers. It is also a healthy substitute to plain flour while making waffles. Kickstart your morning with delectable Green Peas Waffles or Chick Pea and Mint Waffle. Diabetic friendly Godhuma Dosa is made by mixing together wheat flour and urad dal flour. It does not require any fermenting but just soaking of about half an hour. The traditional south-endian tempering to the batter enhances the taste of the dosa greatly. You can serve them with a bowl of sambhar or stuff it with a mixed vegetable stuffing to make Whole Wheat Dosa with Mixed Vegetables. Panki is a popular Gujarati savory snack. They are light on the stomach and easy to digest. The addition of Urad dal flour helps to bind the panki batter and make very thin pankis. Glance through our article on what is a panki? and get more details about them. Green Pea Panki, Rice Panki, Soya Panki are a few varieties you must try making! Kick-start your morning with this healthy Mini Soya Paneer Pancakes. The topping of paneer and green chutney makes it tasty and you would not require any other accompaniments while serving. The combination of rice and urad dal is used to make a myriad of South Indian delicacies like idli, dosa, uttapam. You can use the same combo to make Mini Beetroot Pancake. Kids and adults alike will love these sumptuous and tasty pancakes which taste great as it is. Using leftover cooked rice you can make Rice and Vegetable Chila, a delectable tea-time snack. The addition of urad dal flour balance the mushiness of rice very well. Hope you enjoyed our collection of 26 urad dal flour recipes. Have a great time cooking them! No need to presoak the dals or keep the batter aside for fermentation while preparing the soft great instant idlis. Simply mix together the urad dal flour with idli rava and steam the idlis. Relish the hot and spongy instant idlis with coconut chutney. Instant easy Dosa is very easy to prepare and great in looks and taste. A delicious crispy Dosa recipe for breakfast prepared from a batter comprising of rice and urad dal flour which has been leavened with fruit salt. A crispy rava cheese snack recipe which are basically cheese waffles with corn, tomatoes and semolina. A crispy snacky item, cheese snacks are tongue tickling and bet eaten as soon as they are made.